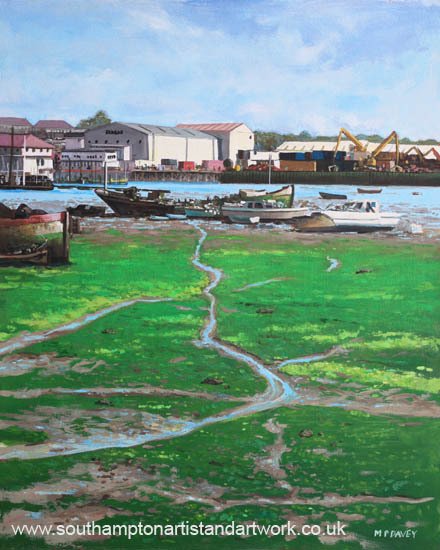 This painting shows the industrial area by the River Itchen at Northam, Southampton, as viewed from the Bittern side. Various boat yards can be seen on the left and on the right are cranes that work at the scrapyard, used for loading scrap metal on to a ship at least once a week. The tide is out and this reveals a carpet of green algae across the mudflats, inter-cut with small streams ow water running through it. A famous feature of the river is the large amount of old boat wrecks dotted around, a number exposed at low tide. The painting is painted in acrylics over a few days, on a board measuring 16” x 20”, during April 2014.